Can I protect my vCenter Server with vSphere Replication? Someone asked this question last week when I posted my “back to basics” vSphere Replication blog. I guess protecting vCenter Server isn’t too difficult but how about recovering it after a failure? Those who have used vSphere Replication know that you need vCenter Server to click “Recover”. In a dual vCenter Server configuration that is not a problem. But what if you just want to protect your vCenter Server virtual machine and replicate it to a second piece of storage. I tested this and then “killed” my vCenter Server. How do I get my vCenter Server up and running again from this replica? Next I am going to copy the “.nvram”, “.vmx” and “.vmxf” file and give them the name “vcenter-tm01.nvram” etc. Now that the original virtual machine is removed unregistered from the host, I should be able to register the “new” vCenter Server virtual machine… aka the replica. Just one question: Wouldn’t it be better to answer the “moved or copied” question with “I moved it” to leave its UUID unchanged? Or will this cause any problems? Duncan – As always, great write up, thanks. I was wondering this exact question yesterday. I’m pretty annoyed that VMware did not anticipate this exact scenario. I don’t understand why they don’t just have the VM ready to be registered to the inventory and started up as a failsafe. In any case thank you for this. Nice write up and exactly what I was looking for for a 2 host vSphere 5.1 installation with VSA (with a 3rd small host running the Tie Breaker code). I understand this is unsupported, but it nicely solves the problem of making sure that you can recover vCenter when the host it runs on dies. I’m gonna see if I can also do all of the commandline stuff with a PowerCLI script. Again Thanks for the pointers! Great write-up – question I’m struggling with .. how do you test a recovery while leaving source VM online? My team has a monthly checklist item where we recover, power-up all replicated VMs to ensure integrity,etc. Would the following work assuming two seperate vCenter environments where VMs cannot talk to each other? The simple answer to this question Eric, is SRM – it’s designed to allow you to test your fail-over process. SRM has a test option that brings up your replicas either in a disconnected virtual network (or a separate one if you have a need for physical connectivity in DR) all without impacting the running replication – so if you have a real disaster whilst you’re testing, you’re still covered. It also supports “fail-back” – so you can rebuild “Live” and replicate to it, then fail-back when everything is ready. I have tried this. 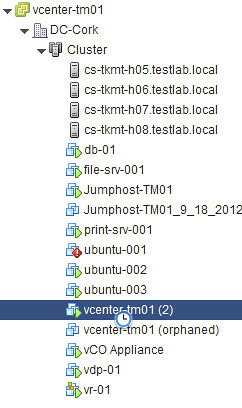 It works but problem is that there is no replication site after vcenter boot. This makes other VM recovery imposible trough web console. Any ideas how to fix this?